When you hear “football” what do you think? For me, “football” elicits memories of crisp autumn nights attending high school games with family and friends… memories of pick-up games of flag football in the park. There’s a nostalgia to these memories, and perhaps a bit of escapism too… escape from the latest crisis in the news… escape back to more carefree days of our youth. These sepia hued memories are imbued with feelings of comfort and of family. With feelings of home. Which is why when I was given the chance to attend a sneak preview of the new film, Game Time: Tackling the Past, I was excited. Plus, with all the hot weather here in Dallas I thought perhaps it’d make me feel cooler. It did better than that, though, it made me think. Which is pretty darned good for a made-for-TV movie. Without giving too much away, let me tell you why I recommend this film. I don’t think it could be considered a spoiler to tell you this movie’s not really about football. Sure it’s lead character is a pro football star, and sure his trip back to his small hometown eventually leads him back to the football field of his youth. But football is simply acting as a metaphor here in order to deliver some important messages. Don’t get me wrong, there is more than enough football for the fans in your household. There’s romance; and for any fans of shows like Glee, there’s even one scene that could have taken straight from a episode of that show. In the end, though, the movie is really about “one thing.” Ah, but no spoilers here. You’ll have to watch to find out exactly what that “one thing” is, and it’s well worth the ride. The story is a bit predictable and production values average, but the relationships ring true. You’ll see yourself and people you know in these characters. And it’s a film you can feel good about watching with your family. You’d expect that from Family Movie Night, but it’s something we don’t see nearly enough of any more. So mark your calendar now and join me Saturday as I watch it with my family. 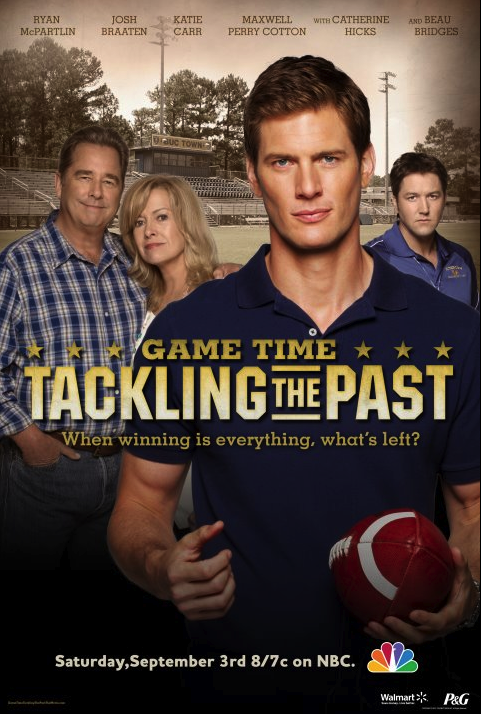 Game Time: Tackling the Past airs this Saturday, September 3rd on NBC 8-10 p.m. ET (7-9 p.m. CT here in Dallas). For more information you can visit the official Family Movie Night website. You can also find (and “like”) them here on their Facebook fan page. Disclaimer: I wrote this review while participating in a campaign by Dad Central Consulting on behalf of P&G and received a promotional item to thank me for taking the time to participate. That said, the opinions expressed are mine alone. Enjoy the film. I did. What memories does “football” conjure in YOU? 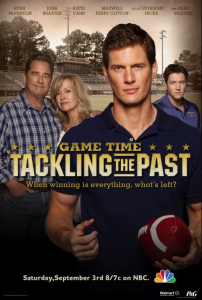 Great review… as for what memories “Football” brings… well, as you well know, Football is kinda like religion ’round these parts… most of my youth was spent covered in sequins and too much make-up entertaining the masses during the half-time show as a member of the… um… Drill Team. 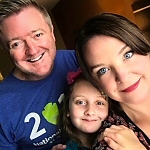 I almost wrote what we were REALLY called (usually behind our backs) but then remembered this is a family blog. in short, some of my best and worst memories of childhood revolved around the hallowed ground and sacred pigskin. Hey there, Shelley. Yes, in Texas football is really big. Drive through any small Texas town, and they may not have a stoplight on Main Street, but they’ll have a huge high school stadium! Thanks for keeping your comment clean. LOL. Yeah, football brings a lot of memories, doesn’t it? 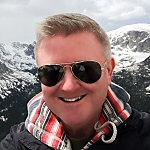 Thanks for your comment! And it stars AWESOME from Chuck??? That is enough right there! And I think I see the mom from Seventh Heaven in the ad? Is that right? I miss that show! You’re absolutely right! They have a great cast. Not only does it star Chuck’s “Awesome” (Ryan McPartlin), but also has Beau Bridges (“Brothers & Sisters,” “The Fabulous Baker Boys” and upcoming “The Descendants”), Catherine Hicks (“7th Heaven” and “Ryan’s Hope”) and Josh Braaten (“Semi-Pro”). They are part of what made the movie work. Good actors playing 3 dimensional characters. This sounds like a family friendly movie. I am not big into football . Thanks. I understand about the football part. Honestly it’s 3/4 done before the first and only game starts. It’s more about family. I think it would be especially good for parents to watch with teens so they can discuss the topics that come up. I encourage anyone reading this who has a blog of their own to drop by Maria’s blog “Tough Cookie Mommy” on Mondays to sigh up for her blog hop. Plus any other day for some frank and expert parenting topics.